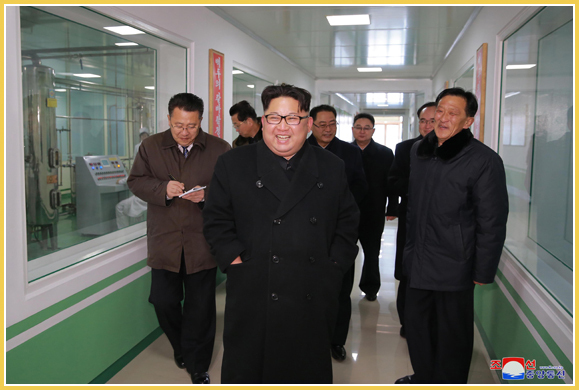 Kim Jong Un, Chairman of the Workers’ Party of Korea, Chairman of the DPRK State Affairs Commission and Supreme Commander of the Korean People’s Army, together with Ri Sol Ju, provided field guidance to the Pyongyang Pharmaceutical Factory. He looked round the rooms dedicated to education through revolutionary relics and the history of the factory. 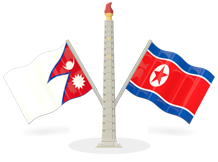 Making the rounds of a packing materials workshop, West medicine whorkshop, Koryo medicine workshop and other places, he learned in detail about the production of the factory. He expressed satisfaction over the fact that the factory has established, for the first time in the pharmaceutical field of the country, an integrated production system suited to the requirements of medicine production and quality managment standards by its own efforts and technology. In order to produce larger quantities of medicines, which is the important material basis for giving full play to the genuine advantages of the nation’s people-oriented public health system and one of basic means for preventive and curative medical care, and supply them to the people, it is necessary to renovate the factory in a more modern way, he said, and set forth important tasks to this end. Expressing his expectation and belief that the officials and workers of the factory would fully perform their responsibility and duty as intended by the Party and make a tangible contribution to giving fullest play to the advantages and might of the socialist healthcare system, he posed for a photograph taken with them.